Locating results for all assessments made using a specific Assessment Instrument can be done from the Assessment Instruments screen. This method of viewing results can be useful for locating incomplete or pending assessments on an instrument. It can also be useful for viewing the number of submissions made to the instrument, number of assessments made using the instrument, as well as the mean and median on the assessments. If you are an Assessor, you will only see your own results. If you are an Administrator, you will see all student results. Assessors and Administrators may view all Assessments that have been made using a specific Assessment Instrument. 4. Locate the Assessment Instrument that you would like to view and click on it to reveal its options. Select Assessments. 5. Information about the page and its contents will appear along the top of the screen. This information will include the number of submissions, number of assessed submissions, the mean score and the median score. 6. The submissions/assessments will be visible on the screen in the table. Don't see the submissions/assessments for which you are looking? Use the steps below to broaden your search parameters. If you do not see what you are looking for, you can broaden your search with custom search parameters. 5. Outcome or Outcome Section. 8. Optionally choose to save your options as Default Search Options. Once you have selected your search parameters, click the Search button. 7. On the next screen, you will be able to view all assessments made with this particular Assessment Instrument. 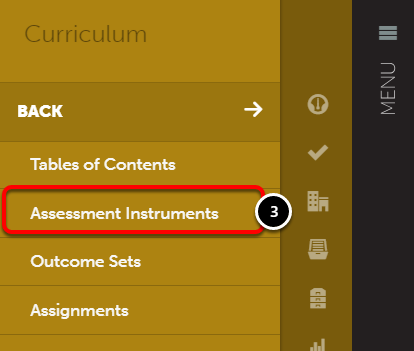 Click anywhere on the Assessment to reveal additional options: View Assessment Instrument, View Table of Contents, View Summary, View Details, Download Portfolio as PDF, Download as PDF with Files, Work, Transfer, Delete, Annotations, View Student Info, and View Assessor Info. Certain options will not appear for various assessments. For example, if the submission does not contain student work (manual assessments, external assessments) the options to download the portfolio will not be available. 1. Click on the Show Bulk Actions button. Delete: If selected, you will be able to bulk-delete student submissions. Please note that this action is final and the submissions will be lost forever. Send Message: If selected, you will be able to compose and send a message (email) to all students whose submissions were selected. The same message will be sent to all students. 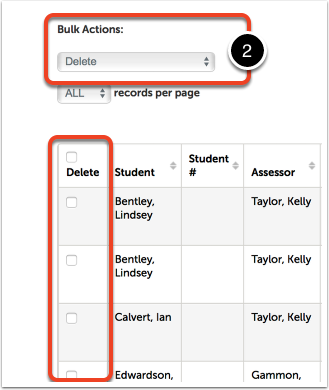 Transfer: If selected, you will be able to bulk-transfer student work to another assessor and/or assessment instrument. Learn more here. 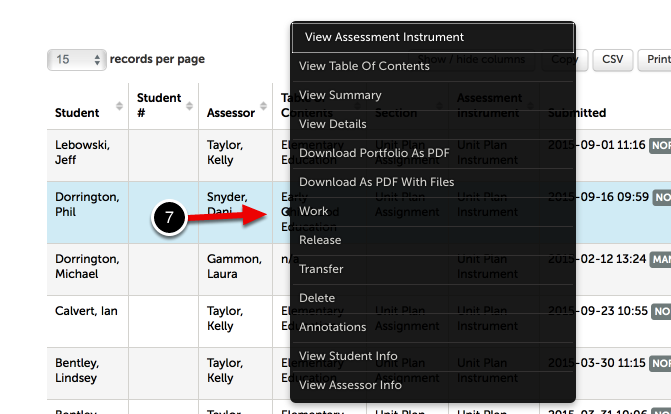 Release: If selected, you will be able to bulk-release held assessment results. Learn more here. Export Student Information (Admin Only): If selected, you will be able to download student information for all students whose submissions were selected. Student information includes login ID, name, email address, last login date, expiration date, etc. Whichever option is selected, a new column will appear in the table with the appropriate bulk-action heading. 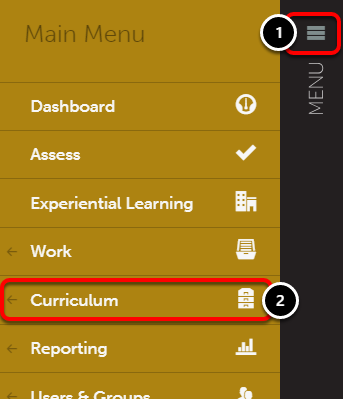 Copy: Use the Copy button to copy the Results table to your clipboard. CSV: Use the CSV button to download a CSV file to your computer. Print: Use the Print button to load a print-friendly view of the Results table. If your results include results from a met/not met instrument, you will need to open the downloaded text file and replace all forward slashes (/) with backslashes (\) prior to pasting the content in MS Excel.